Hole In The Rock Road is just about 60 miles. 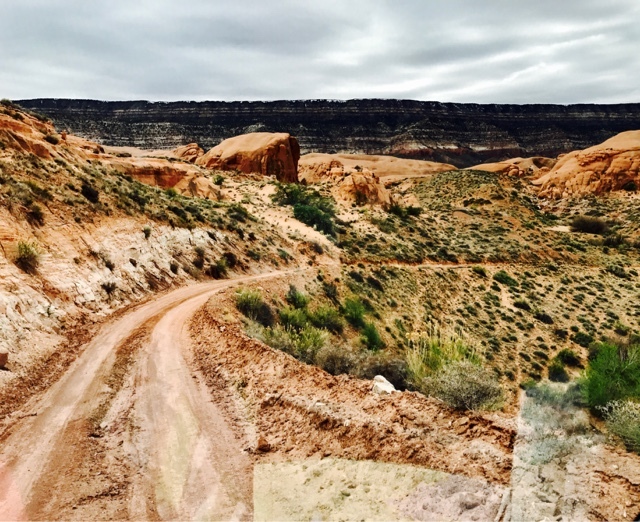 The last 10 miles is 4x4 only and even with off road capability it is often slow rock and washout ridden road that you must transverse very slowly. 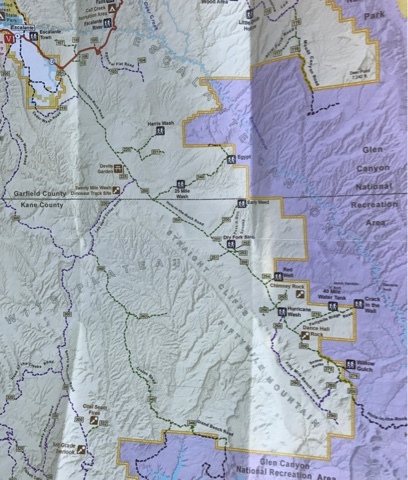 Above is a phot shot of the map the GSENM Visitor Center handed out to us in Escalante. Always stop for maps and directions to save you time on what you can see based on skill and time you have available. 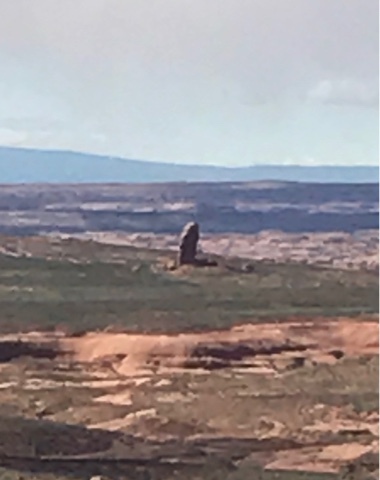 Oh, if you run into problems it is unlikely you will have cell service and you are over 60 miles away from the closest town of Escalante. I can say that I had good AT&T service at the campground and Joanne had better cell service on parts of Hole In The Rock Road. I did not go to Hole In The Rock as I didn't have a 4x4. Joanne's high clearance Sprinter tried to do it and Joanne did an excellent job of transgressing obstacles, but at one point we found it way to difficult to drive that last section. Let me just say the above picture does not do justice to my claim of it being tough. Not only is it mostly one vehiclebwidth wide you meet others and dance backing up pulling to the side and bite your fingernails if you are the passenger as you watch the drivers knuckles turn white from the hard grip on the steering wheel. What is Hole In The Rock? I will leave the explanation to WIKI. 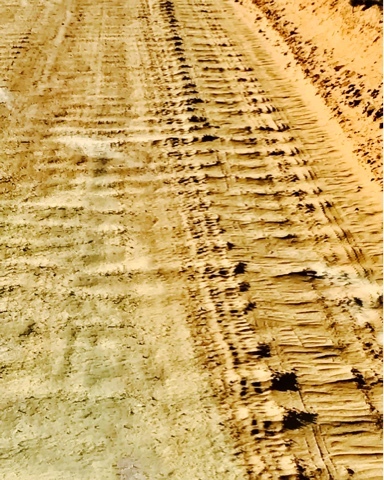 The first 40 miles (or so) of Hole In The Rock Road is wide and a teeth jarring washboard. Guaranteed to test your patience, but the reward is worth it. As you will see below. Any vehicle can drive this section provided it can take the vibration. The next 10 miles (or so) of the 60 mile road is washboard, ruts and narrower with cattle guard crossings that would have caused me to possibly not cross with my Prius. The cattle guards often have drop offs where dirt is missing and are in a knoll and with low clearance you can hang and then cause damage. High clearance vehicle is best for this section. I already mentioned the last 10 miles and that is 4x4 high clearance only. I wouldn't recommend crossover all wheel drive due such harsh conditions. I will proceed to review the rest of the 50 miles and what there is to see. All distances are from RT 12 unless otherwise noted. 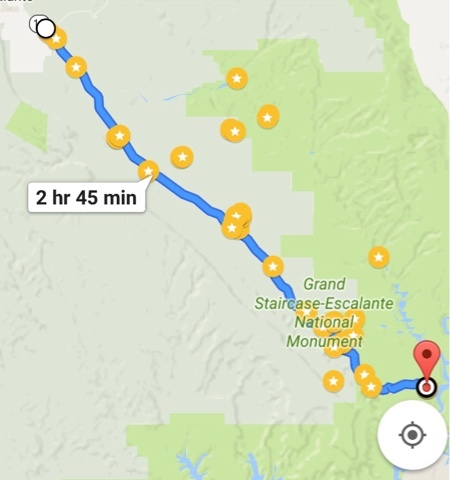 It took me a few hours to transfer pin drops on my Google Map to highlight things to see off of Hole In The Rock Road. Some pin drops are at intersections that you need to turn at. It's great to click on the pin and let the Google GPS locate and give directions. 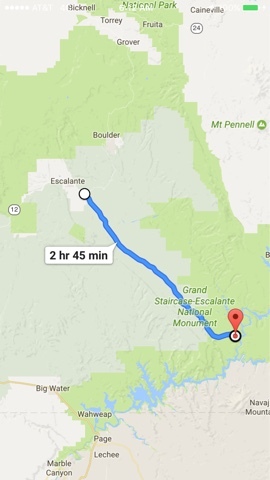 Cell service is limited and mostly nonexistent, so it's important to download the Google offline map for the area while you have signal or WIFI so you can track your location and destinations without cell signal. The map above is the upper (northern) half of the Hole In The Rock Road. At the beginning of Hole In The Rock Road is the BLM disbursed camping area. 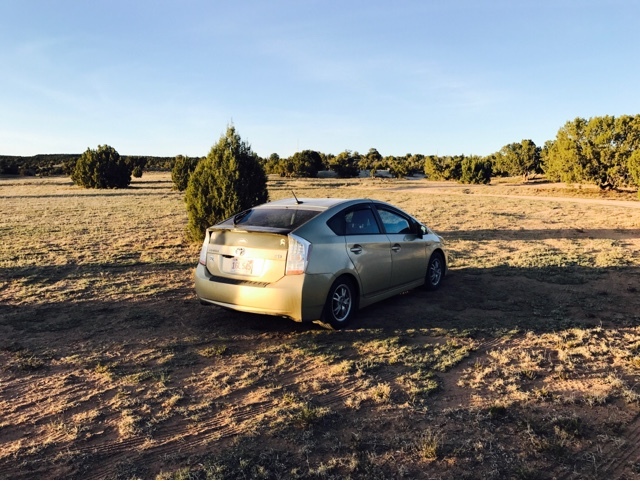 Here is my Prius camped. There are others around but not a lot. Camping is free and only offers rubbish. No pit toilets here. * At 11 miles is the road to Harris Wash. The road to Harris Wash is 6.1 miles from Hole In The stock Road. 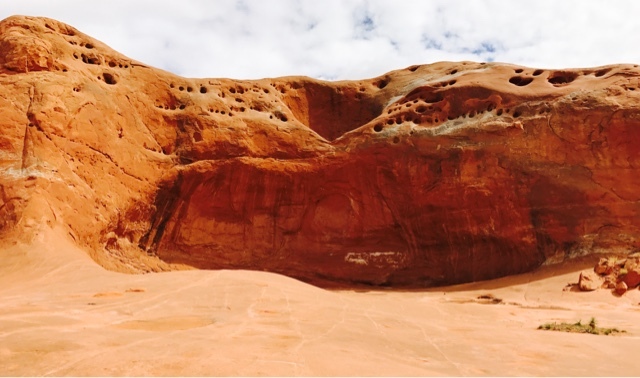 The first sight to see heading south on Hole In The Rock Road is Devils Garden. It's the first pit toilets on the road and is 12 miles south of route 12 intersection. 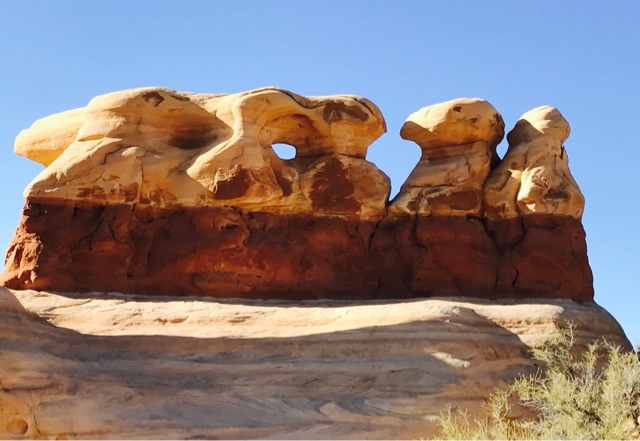 * At 14 miles is Twenty Mile Wash & Dinosaur Track site. * At 17 miles is Twenty-five Mile Wash & Egypt Road that takes you 10 miles to a trailhead to enter the back country for a long hike. This is noted as a good site to wilderness camp. *At 22 miles is a road to Early Weed Hike Trailhead. * At 26 miles is the turnoff for Dry Fork and Slot Canyons. There are two parking lots. The first lot is best gotten to with a high clearance vehicle. The trailhead is one mile further and requires 4x4 to access. * At 33 miles is the road to Lone Rock. 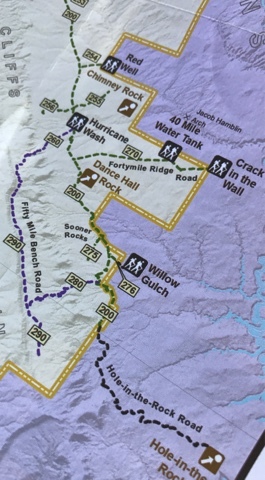 * At 34 miles is the road to Hurricane Wash.
* At 36 miles is the road to Forty Mike Water Tank and Crack In The Wall trailheads for hiking. 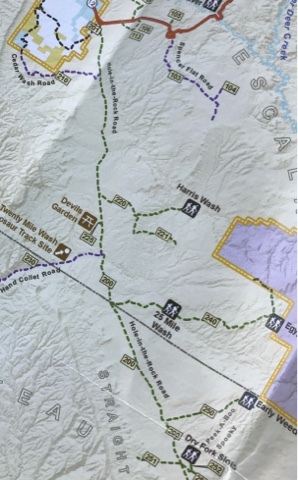 * At 42 miles is to the Willow Gulch Trailhead. 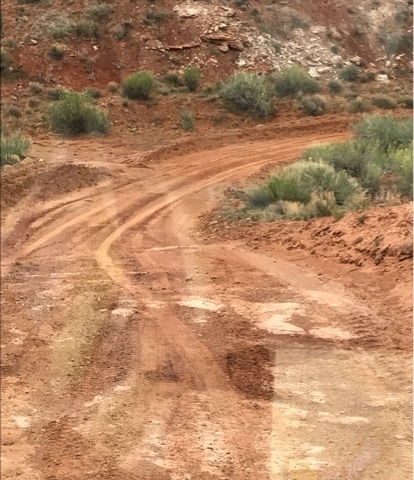 All roads off of Hole In Thr Rock Road are recommended as high clearance roads if not 4x4 required. My Prius was not the car to tour the Grand Staircase- Escalante so I will need to see about doing these other hikes in the future with a 4x4.